The U19/HS Girls have started their 2012 season with a trip to St Pius X High School in Houston on February 25th. The day started with morning directed by Anna Krunkel, Rugby Texas Girls' Coordinator/HP Coach & UT Women's Rugby Head Coach. Afterwards, the girls played two games of Sevens Rugby. Participating clubs/teams included: host St Pius X HS Girls Rugby, The Woodlands U19 Girls, Kingwood HS Girls Rugby, Panther City/Alliance Combined U19 Girls Rugby. It was clear that North Texas/DFW has some work ahead to recruit and develop female rugby players to keep place with the South Texas/Houston Area teams. Austin HS Girls Rugby traveled to Fort Worth on March 3rd for a seven's match against our U19 girls. Unfortunately, we were unable to field a full-side. Luckly, Austin was eager to play and generously loaned us three girls for a 6-v-6 match. Over the three 10-minute periods of play, all girls demonstrated great improvement in moving the ball as a team. For Panther City, Megan Williams stepped up her runnung and passing game. She had two tries (socres) for the day. And, Baylie Funk showed off some advanced running skills that lead to two tries (scores). She also took on team leadership responsibilities as captain and scrumhalf (similiar to a FB QB role). Alliance Rugby successfully hosted the third and final seven's tournament for the Fall Seven's Season. Eight teams from the DFW area participated in the event held at Keller Sports Park in Keller, Texas. Continuing with the developmental nature of the Fall Tournament Series, all teams brought new players to compete. Though the scores were sometimes lopsided, all players - and coaches - exhibited great sportsmanship. As intend the Fall Tournament Series provided new players with a great introduction to the sports Rugby. It also provided coaches with some insights for areas to work on going into the Rugby Texas 15s Season which starts mid-January 2012. Looking to continue a third season next year, the Rugby Club of North Texas welcome clubs from Waco and Norman, OK, to our pool of participants. We also look forward to introducing skill clinics and matches featuring different university rugby programs. Stay tuned! 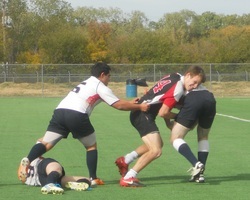 Panther City Rugby hosted its second annual fall tournament for 7’s Rugby on Saturday, November 12th at Gateway Park in Fort Worth, Texas. This year was the best yet. Eight high school (U17/19) teams participated from around the DFW area and Oklahoma. In line with the developmental intent of the fall tournament season, all teams brought many new players with them. Immediately preceding the tournament, a 90-minute clinic was offered for new players to receive additional instruction on contact skills, rules and safety. The clinic was definitely a success given the few contacted related injuries that occurred during the tournament. And, these were minor. All teams brought competitive play to the tournament. For the new players coming over from football, it was an abrupt change in physical demands. While the physically of tackles and other contact skills were present, many were not ready for the continuous play of the game. Seven’s rugby in particular is often described as having to repeatedly run 100-meter sprints that are only interrupted by someone tackling you. At the end of the six-hour day, the players definitely had their fill of rugby and were ready to head home to relax. Though this was a developmental round-robin style tournament, teams agreed to compete towards a championship. As somewhat expected, Plano Rugby Club took “first place”. Coppell HS Rugby Club surprised us though taking “second place”. Tying for “third place” was Allen HS Rugby Club and Alliance Rugby Club. Norman Colts U19 Rugby Club and Panther City Rugby Club finished in “forth” and “fifth” place, respectively. Panther City Rugby would like to thank all the clubs/teams for participating. Beyond the good competition, good sportsmanship was highlighted and new friendships were established. We also want to thank the young men and women of the TCU Rugby Program for assisting us with the tournament. Plans are underway for all of next year’s fall tournament series to highlight a university rugby program; perhaps even hosting a collegiate match.